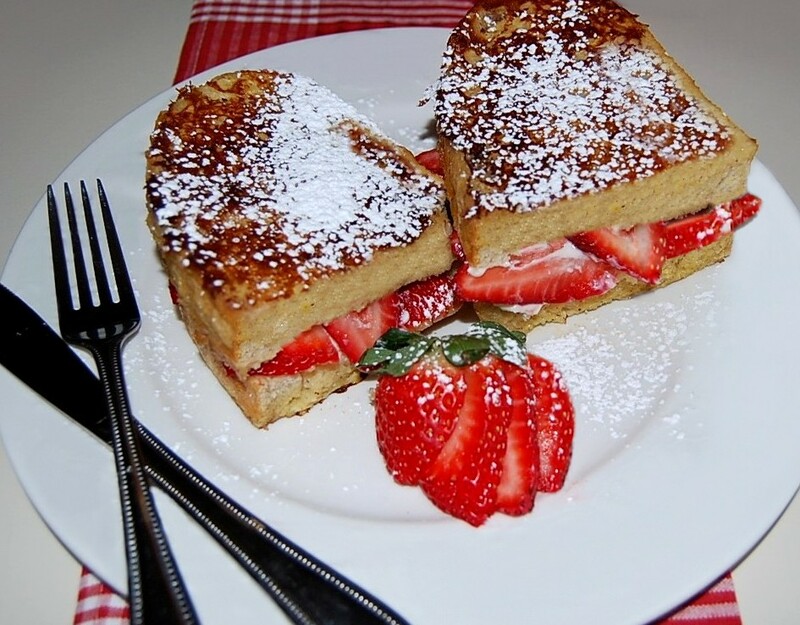 Start your Valentine's Day off right with our Strawberries & Cream Stuffed French Toast!! Laying each slice of bread on its side lengthwise, create a pocket by slicing the middle of each piece, but not slicing all the way through, to create a single, hinged piece (much like a clam shell). DO NOT SCOOP OUT THE BREAD. Do this for all 6 slices until you have created 6 pieces, each with a hinged pocket. Set aside. In a medium-sized bowl, beat cream cheese, Mascarpone cheese, and confectioners' sugar until well blended. Set aside. Slice 6-8 strawberries to desired thickness. Open each bread pocket, and spread a thick layer of cream cheese mixture into each. Lay 1 row of sliced strawberries atop each layer of cream cheese, slightly overlapping the berries as you go. 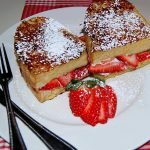 When you are finished, each pocket of bread should contain a single layer of cream and a single layer of strawberries. Set aside. In a medium-sized oval or rectangular dish, whisk together buttermilk, eggs, sugar, nutmeg, cinnamon, salt and lemon zest until blended. Melt 2 tablespoons of butter in a 12″ skillet over medium heat. Dip (don’t soak) each stuffed piece of bread into the buttermilk and egg batter, taking care to cover both sides. Drain slightly before setting each piece into the skillet. Frying no more than 3 pieces at a time, flip each piece over after the bottom reaches a light, golden brown. Continue frying until second side turns a light, golden brown as well. Keep cooked pieces of French toast warm in a 250 degree oven while you continue cooking the remaining pieces of stuffed French toast. Place on individual serving plates and dust lightly with confectioners' sugar. Garnish plates with additional whole strawberries, or slice and fan strawberries to garnish. Serve warm.